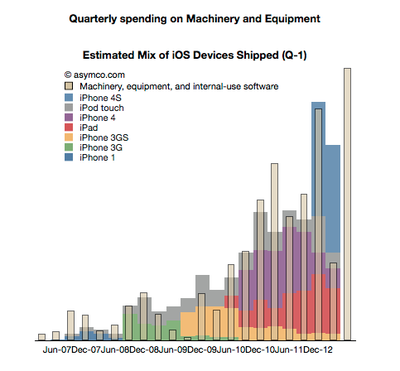 A new spending report from Asymco revealed that Apple is investing heavily in new machinery and equipment. So heavily, in fact, that the company spent a record breaking $1.3 billion on machinery and equipment during last quarter alone. Asymco analyst Horace Dediu, the author of the report, said that Apple will need to spend $2.5 billion per quarter for the next two quarters in order to meet its capital expense expectations. "Such numbers are hard to grasp," Dediu said. "They are unprecedented not only for Apple but for almost any comparable company. Just as a reference point, they will have to exceed the historic average CapEx rate for Google by more than 100%." What exactly is Apple up to? We don't really know yet. The spending could be attributed partially to its new campus, but Dediu doesn't think Apple is going to get started on that project before October of this year. "The burn rate of construction will be spread over 2 to 3 years, " he explained, noting that the spending wouldn't be attributed to a single quarter's machinery and equipment costs. Capital expenses "include buildings, land, tooling, office equipment, internal use software and improvements to stores," Dediu explained. "This is why this measure is significant. Technology companies don't usually spend on these items. Industrial companies involved in manufacturing are called "capital intensive". They buy factories or ships or oil drilling platforms. Apple is spending more than any of these "capital intensive" businesses." Could Apple be building its own factories? Dediu said that it typically costs auto manufacturers about $2 billion to build a new manufacturing factory and Apple is set to spend that much each quarter for the next two quarters. One Asymco commenter made a more compelling suggestion: that Apple's investing more in its data centers. The company is currently adding solar panels to its North Carolina facility and has plans for a renewable energy data center in Oregon. Perhaps, as the commenter suggests, Apple is planning to open new centers around the globe. Or maybe Apple has big plans for expansion in China, which wouldn't be a surprise. "The iPhone has approximately 300 million installed base," Dediu argued in a separate post earlier this month. "I consider a base of 1 billion users to be a minimum for continuing participation in this market long term. Licensed platforms will reach this in no more than two years. I don't know what Apple's ambitions are but if they don't triple their base I don't see a strong future for the company in mobile phones." China, no doubt, could be the market that Apple needs to tap in order to hit its 1 billion user base. It may have plans to spend more on data centers and other facilities there. That won't be its biggest problem, though. An analyst with Frost & Sullivan in Singapore recently explained to Reuters that the "rule of thumb" to selling a mass market smartphone in China is to set the price around 70% of the average monthly salary. Apple's iPhone currently costs more than two months the average salary in China, however. That's why local brands such as ZTE and Huawei recently are gaining market share in China while Apple's market share has fallen to 10.4%. There's plenty of talk surrounding Apple's sixth-generation iPhone, a possible 7.85-inch iPad Mini and the company's highly rumored Siri-powered iTV. Are those products responsible for the CapEx increase? They could be, especially if Apple needs to retool its factories in order to produce them. "The increase in M&E is the highest for any quarter to date," Dediu said. "Some of that is undoubtedly in service of the new iPad but some must also be the initial ramp-up for the new iPhone… New products per se don't require capital expenditure and distribution expansion does not either," Dediu explained. "Data center equipment and tooling do qualify."